Do try this delectable rice recipe with chicken, which is one of the most delicious experiments held in my kitchen. A fusion of Italian and Indian cuisine which is very easy to cook, bursting with flavors that make this recipe a winner. I fell in love with alfredo sauce after making Alfredo chicken pasta last month for the first time. Since then, i often make this Italian dish at home as it is fast and fantastic. I was thinking for a twist in my every trial that makes me put my hands on this special rice recipe which was a great hit in my kitchen. It is such an interesting Italian rice recipe. 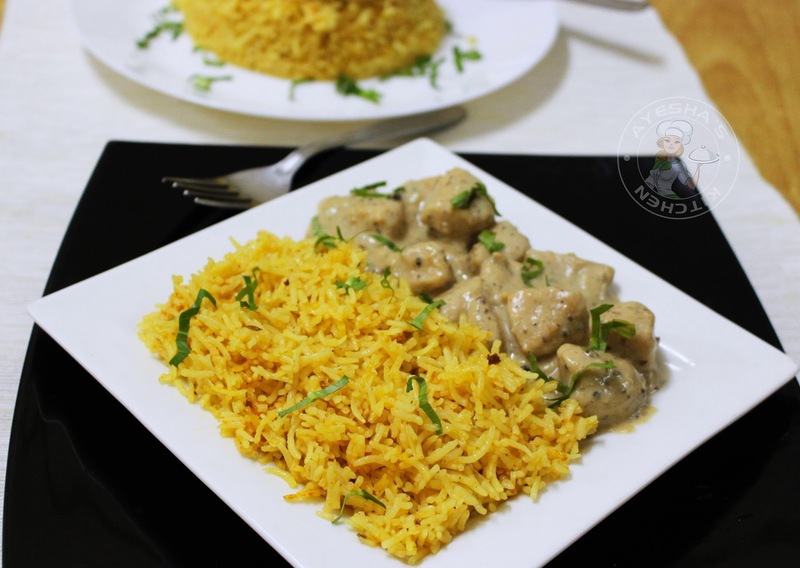 An Alfredo chicken biryani with Indian and Italian fusion. For that, i made a flavorful biryani rice recipe with Indian spices. And then made the traditional Italian food/cuisine, chicken alfredo. 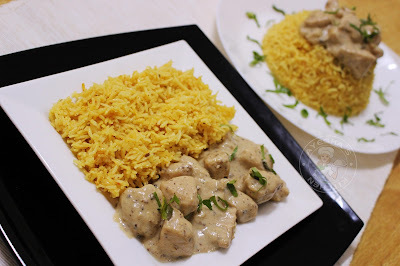 And finally blended the biryani rice with alfredo chicken. It is a must try rice recipe for sure. Hope you all will enjoy this recipe. Please drop your valuable comments in the comment box below. 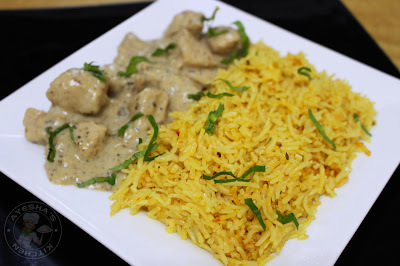 Here is the recipe for Alfredo chicken biryani/chicken rice /chicken with rice recipes /alfredo dishes /rice recipes / south Indian rice recipes /easy simple healthy rice recipes /Italian recipes / Biryani recipes. Enjoy. Heat butter in a pan and toss the cubed chicken for a minute. Then add, 1 tbsp garlic fennel seed paste (add 4 garlic cloves and 1 tbsp fennel seed in a mixer and grind to a paste by adding little water. )Then add crushed pepper, a pinch salt and give a fine stir. Cook until the chicken is almost cooked. Be careful while adding salt. Add less salt as we are sauteing this chicken in white sauce with salt. Transfer it to plate and set aside. In the same pan add olive oil and saute the thinly chopped garlic until raw smell goes off over a low flame. Do not burn the garlic. When done, Make the flame very low and then add thick cream, milk and mix well. Now add shredded cheese and Combine well until it thickens to a saucy consistency. Then add the cooked chicken. Combine well. Finally, add a half tsp of garlic fennel seed paste to it along with salt if required and simmer for 3 minutes or until the gravy is well coated in the chicken. ADD LESS SALT ALWAYS. Remove from fire and let it set aside until the rice is done. Firstly, clean the rice well and soak the basmati long rice in water for 15 minutes. This makes the rice soft. When done, drain the rice and set aside. Heat over a low flame, the same vessel we made alfredo chicken. Add olive oil or veg oil. To this add the sliced onion, cardamom, cumin seed, cloves, cinnamon, bay leaves and saute until transparent. Then add garlic fennel seed paste and saute until the raw smell disappears. Then add the tomato puree and cook for 2 minutes or until done. Combine well and then add the turmeric powder. Mix well. When done, add the drained rice and fry the rice in this mixture gently. Let it stay for 2 minutes over a low flame. This makes a perfect texture and stiffness to the rice. Add dried lemon(make holes in it), required salt and mix well. Cover and cook until all the water gets dried or until the rice is done on a medium flame. When done, never mix immediately. Let it cool for 10 minutes, spread some ghee over the rice and then mix. 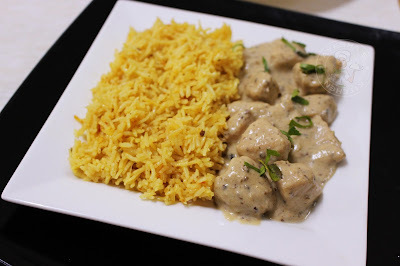 The given photo is just before mixing the cooked rice with alfredo chicken for the photo clarity only. You have to mix well for the perfect flavor.